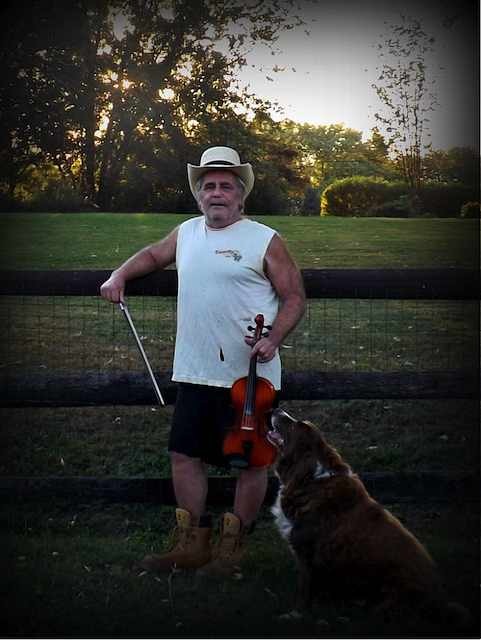 Meet "StoneDog" from Fiddlerman's "Fiddle Talk" forum | LEARN TO PLAY THE VIOLIN FOR FREE! Please begin by telling us anything you would like to about yourself. Age, place of birth, residence, etc. Hi, StoneDog here. I am 62 years on the planet and rocking on. I live in Pittsburgh, Pa. USA. I have a son who just got out of the Marines and a daughter who is a senior at Lincoln Park Performing Arts High School. Really great school. She spends half her day doing musical theater, dancing and singing > SWEET!!! The sound of this instrument sends bolts of pleasure though my spirit. I’m a guitar player. I like putting musical tracks together. I also play with vids a bit. I have a few things out there. I can put the rhythms, base, drums, and other various percussions to my tracks. (I have attached an mp3 of one of my tracks I did about two years ago) BUT what has always been missing and something one cannot just import into the tracks I work with is the VIDDLE. 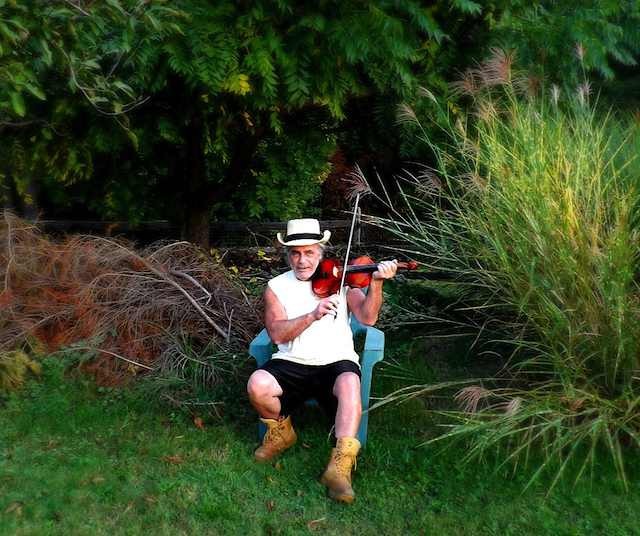 When working with my music I have always had the need to hear some violin/fiddle within the track. SOooo I figured I better learn how to play one. Wellllllllllllllllll > easier said then done. Eight months. I started in mid January. One to two hours a day. Not very proficient, but gets better every day. I played a lot at night in the yard this summer > I just played in the dark on a chair and what was sort of cool was that a lot of lighting bugs would hang out and just land on me and the viddle. Also rabbits come out in my yard at night and they would just sit there about ten feet away. Yeah, like 6 or more at a time. Very strange but yet somewhat enlightening. Music is my out of all the crap the world throws at me. The good Lord just dumps buckets of crap on me all day long sometimes but he gave me music to soothe my soul. Seems no matter how low in the valley I may be, music takes me back up the mountain and lets my spirit fly free. Any and all that play influences me. Short goal is to learn it with some proficiency. Long goal is to interweave it with my guitar work. I run scales for quite some time. I then work on some pieces and usually finish off with just playing and see what flies. I like all types of music. What do I listen to the most? Me. Right now it is “Sweet Georgia Brown”. Why? Because I am trying to learn it. 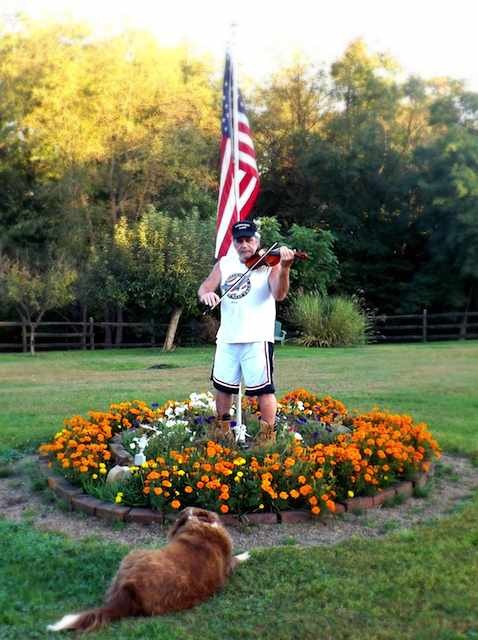 What are your 2 favorite things to do other than playing violin? Playing the guitar and gardening. No, although my daughter is very talented in musical theater. Not now, I used to be in a few RnR bands. What do you work with? I do software support for a paycheck. If that is what this question is asking. Would you please share with us information about your violin and bow and if you have several please tell us about them as well. 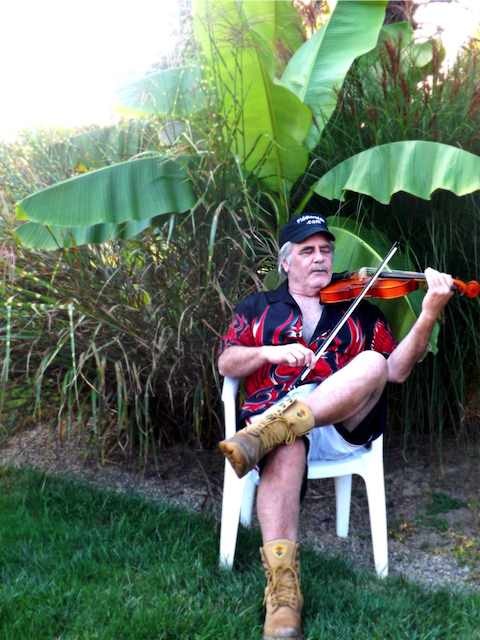 The Fiddlerman.com site has opened up a whole other world for me. Thank you all for letting me be part of this virtual family > ROCKS!!!!!!!!!!! !